Sleek and low profile. Screw holes are hidden under the polished brass flange for a clean appearance. Height is 2-3/4" . Overall width including flange is 4-3/8" . Requires boring a 2-7/8" installation hole. Use in spaces over 12" x 12" x 5" and over 2" away from cabinet wall. 40 watt clear light bulb included. Master Light - Comes with a switch, 10' cord, and 24" extension. Dependent Light - Wire a maximum of six light. 24" cord extension. Replacement of existing cabinet lights with standard light bulb. Needed for dining room hutch. Would have preferred Antique Brass but you do not carry that anymore. A direct replacement for the can lights in our flyover light fixture. What type of bulb is required candelabra, intermediate based, standard edision? BEST ANSWER: It uses an intermediate base bulb. The bulb that are supplied with the fixture don't last very long and then I replace them with IKEA LEDs that last forever. The fixtures are excellent. 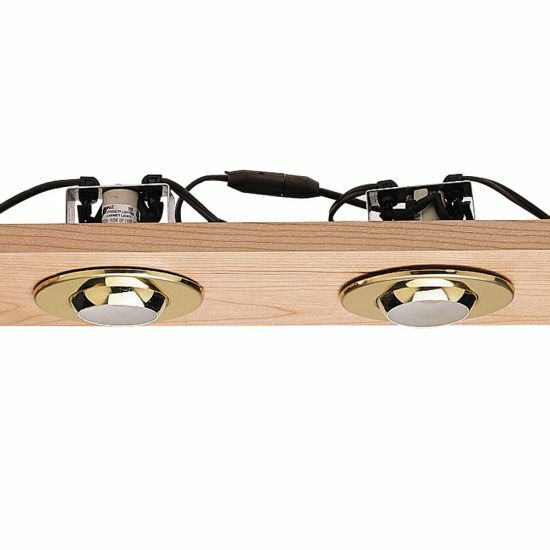 Will these lights work with a queen size murphy bed sold by you? BEST ANSWER: I'm not sure. I used these on a bed I designed myself and they worked fine. Note that there is a master light and a different stock number for additional lights. The master light has a switch and the additional lights have plugs that link them all together. Yes, I have the set in my custom made Pier Group; and it's a King size. Is there a dimmer switch available for the #88676 light? BEST ANSWER: You need to hard wire the light to a standard dimmer switch that fits in a wall mounted switch box. 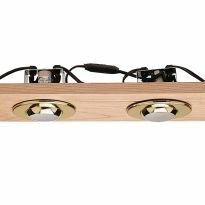 I have several of these lights and they use standard incandescent light bulbs which are compatible with a regular dimmer switch.